I've not tried this yarn before and I'm very pleased with it... no splitting. 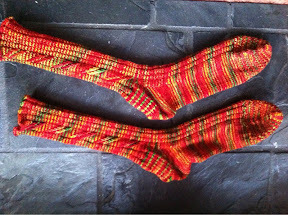 These socks are for a friend who is getting married. The colour is called Wedding Bouquet ... very fitting methinks. Note: Left Twist (LT) as follows: skip 1 st and knit second st in back loop, then slip the skipped st purlwise onto the needle, then slip the knit st also.